Yes, there are legitimate concerns about the time/location stamps and what would actually be written on these postcards, but I’m sure if you asked my sister Laura these questions, she’d have an answer for you. 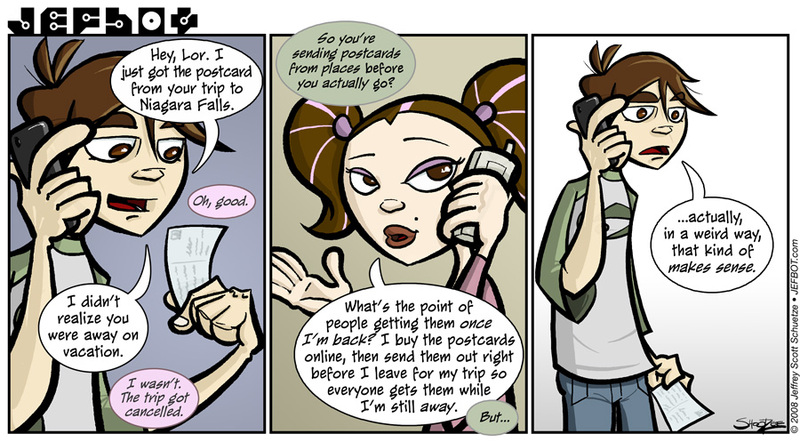 I always thought it was kinda useless to get the postcards after the person got back… especially when the person who went away is someone you live with. See? Exactly. Shan M totally gets it. Yeah! That’s why I don’t even send postcards! I LOVE that you are related to someone who; a.) orders post cards on-line and b.) sends them as she is leaving on her vacation. I always found looking for post cards on vacation, a fun adventure… I guess some people find searching in tiny gift shop in Mexico wild, and others find it crazy enough to brave http://www.vacationpostcards.com a wild journey! I may start sending postcards to people just to let them think I’m the globetrotter I wish I was. Maybe I’ll send postcards FROM other people so their families will think they’ve skipped town. See what you’ve started? Gosh I love this strip. Hmmmmm, I always thought that my friends liked reading about what I had already told them happened on the trip. I view my stories important enough to relive a couple more times, preferably in hurried handwriting. This has got to be the funniest and scariest strip yet. I think Lor just surpassed Xinda on the wacky scale. Well done, JEFbot. And run. definately, this sister is the craziest! That makes complete sense. I like the way Lor thinks! Some of the comments on this strip are hilarious. I also love the title of this strip, “Wish You Were There.” 🙂 I might just start writing that if I take up Milas’ suggestion, with a twist. Pink Floyd reference for the win.